Your excursion begins as you board your motorcoach for a scenic, narrated drive through Ketchikan to Air Marine Harbor. Keep your camera within easy reach, because photo opportunities abound on this seafaring excursion! It’s no wonder it was the recipient of a C.R.U.I.S.E. award each of the past 10 years! 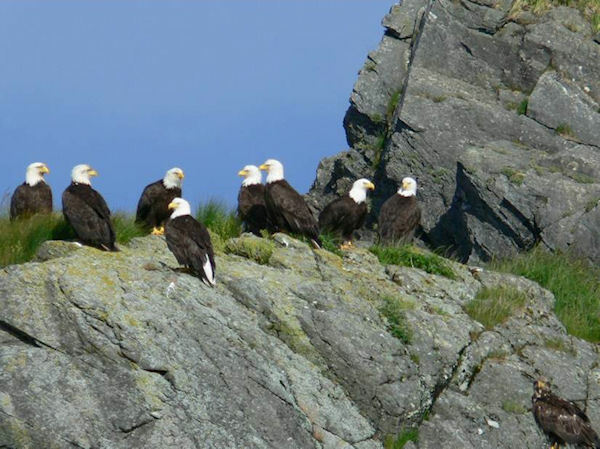 Featuring guaranteed abundant eagles, 10 eagles nests, Totem Bight State Park, Vallenar Rocks Wildlife Viewing Area, and historic Guard Island Lighthouse, you're sure to see all the best sights! Meet your captain and Alaskan crew at their private dock and board your vessel. You’re free to relax in the heated main cabin or enjoy the open-air observation deck, as you witness an abundance of eagles with binoculars provided to you. You will see 10 eagle nests and baby eagles in season. Harbor seals, Pigeon Guillemots and moon jellyfish are commonly spotted daily. Whales, deer, blue heron and a variety of sea birds are seen through the entire season. Along the way, you’ll hear of the area's maritime history, the rich Tlingit culture, the timber and fishing industries, and local lifestyles. You’ll observe harvested and old growth areas of the Tongass National Forest, and travel past historic Ward Cove Cannery. You’ll continue to Loggerville, the "Floating Ghost Town of Alaska", and circumnavigate the Guard Island Lighthouse established in 1901. No other excursion offers this itinerary, nor offers a view of Totem Bight State Park from the water. You’ll view the Totem Bight clan house totem poles, including Ketchikan's tallest totem pole. You will travel past the park, and see colorful cabins, mansions of the local rich and famous, and unique homes - many built on their own islands! Your deckhands are pleased to take your picture in front of the totem park or lighthouse, or pose with your captain for a memorable photo in the wheelhouse. Your captain will unravel historic mysteries of Alaska's most dangerous Island, Danger Island, and you will circumnavigate or have clear viewing of a total of 12 islands on your tour route. Many of these islands are inhabited only by Alaska's wildlife. Enjoy Alaska’s most scrumptious Hot Chocolate Supreme, coffee, tea, water or your favorite soft drinks along with salmon spread, cheese, crackers, fresh fruit, cookies & mints; all complimentary and make for a delightful treat as you take in the breathtaking seascape and professional narration. Our salmon spread recipe will be provided to you to take home. Eagle photo portraits, limited edition prints, Guard Island Heritage lighthouse memberships, post cards, pens, magnets, local knit caps and plush animals are all available from our on board gift selection. Don't forget your camera. Departure times for this tour vary daily and are based upon availability and your ship schedule. Vessels are USCG (Coast Guard) certified to accommodate a maximum of 50 passengers.